Companies of all sizes understand the importance of innovating and growing their business to avoid becoming stagnant, irrelevant, or an industry follower. One competitive advantage many top-performing companies have is how they incorporate ideation and innovation management into the company’s culture. In the webcast, “Can You Measure Innovation Impact? Announcing A New Science in Innovation,” Virginia Lee Williams, Vice President of Global Innovation Management Solutions at Planview, and Bobby Cameron, Vice President and Principal Analyst, Serving CIOs at Forrester Research, explain how ideation and innovation management can make a positive impact to the business, how to measure it, and how successful ideation correlates to growth. They share insights from a Havard Business Review article titled, “Data From 3.5 Million Employees Shows How Innovation Really Works,” which brings five years of data from 154 public companies covering over 3.5 million employees using innovation management software and conducted by Northwestern’s Kellogg’s School of Management. This blog highlights valuable insights from the webcast and the study that will help you take your innovation management program forward. Today’s enterprises are challenged to define the innovation culture, measure it, and implement it. Leaders are often concerned with two things: Not having enough ideas, and/or they are not satisfied with the effort to internally collect and collaborate on ideas. While 84% of CEOs (McKinsey & Company Study) prioritize innovation as a top priority, many struggle to find the most effective innovation strategy. A key to successful idea capture is collaboration and engagement. The trick is leveraging the culture and the people who know your business the best to deliver ideas to facilitate innovation. This is corroborated by the Kellogg study which identified 86% of the companies created an innovation program to create a culture of innovation. These companies define innovation and make it their discipline. Once a company understands that innovation management is a business discipline, a plan can be created to achieve desirable results. Historically, much like sales and marketing, decisions were based on emotion and qualitative insights. You can measure these disciplines with definable pipelines and benchmarks. The right innovation management technology can manage both those pipelines and the people involved in the process. Organziations must take raw ideas and turn them into actionable tasks that result in successful innovation. According to the Kellogg study, success at ideation correlates to business results and is dictated by a formula establishing that innovation is indeed a science. The key formula to a successful ideation program is the ideation rate which is the number of winning ideas divided by the number of active participants. Higher ideation rates are correlated with growth and net income. According to the Kellogg study, there are four key variables that drove the ideation rate. Scale: increase the number of active participants beyond idea submission. Frequency: run more campaigns to increase involvement. Engagement: drive awareness and participation by running an ideation challenge, a marketing campaign, or an incentive for increasing employee participation. Diversity: direct the campaign to a wider audience. Innovation is about taking ideas and generating business results. Innovation is measurable, sustainable, and repeatable. The study’s findings suggest the following recommendations to improve your innovation programs. Top performing companies run more ideation challenges. Leading ideation performing companies use the collective intelligence of their employees, partners, and customers frequently—as much as 100 challenges each year. High performing companies average about 24 challenges each year. Involve large groups. Companies that extend their ideation projects to non-experts, including employees outside of the designated business area, achieve better results. The best performing companies had more than double the amount of average employee participation in challenges. Employees can and should engage in the process with more than submitting ideas. Voting, commenting, and participating in the process is also be encouraged. Companies leading in performance, had employee engagement rates two and a half times higher than the other companies. When it’s time to incorporate an innovation program, understand that each innovation initiative requires moving through a repeatable process with a set of activities. The Kellogg research introduces the 5 activities within an innovation cycle. An innovation program will include many cycles and participants. The more innovation cycles a company completes, the better the results of innovation and its impact on the company’s growth and performance. Targeting: It’s important to engage the best people, or business entity, that would benefit from a particular innovation. Focus on a specific opportunity defined by strategy, trends, and customer expectations. Defining this will lead to the criteria for idea selection and prioritization. Ideation: Engage idea sponsors to define and test a small set of ideas to identify those ideas that will most likely deliver the best new business value. Incubation: Requires funding to actively and iteratively prototype or test the ideas which are reviewed by the idea sponsors and evaluate which ideas will result in a business case for the next stage, commercialization. Commercialization: Isn’t funded as part of the innovation cycle. It’s part of the typical business process such as in production delivery. These ideas are developed and refined over time. Measuring: When creating an innovation culture, you need to measure how well things are going. The way to do that is to measure the business results from an innovation cycle. You know your company is innovating when the ideas that are sourced and matured through the innovation cycle (not the annual spending cycle) are generating results as well or better than the results from ideas generated through your annual spending cycle. How Do You Establish a Culture of Innovation? Forrester research found the following four steps you can take to create a culture of innovation. Make innovation central to your strategy. Actively focus on innovation that drives desired outcome and use new technology to improve the customer experience. Celebrate experimentation and discovery. Encourage leaders to show their support for their personal engagement and support the idea generators. Bring innovation as a part of key roles and offer motivation for experimentation and failure. That’s where you make important discoveries. Make change the new normal. Responding to new ideas and opportunities allows companies to make necessary changes quickly which is crucial for successful business and innovation factors. Customer Experience: Companies are looking at these customer experience factors to determine where and how to invest in improving the customer experience for both external customers and internal partners. For example: Tools like mobile apps and websites bring more of an end-to-end customer value stream which is essential to drive improvements with digital technology. It’s the wrong thing to focus on delivering a mobile app just for the sake of having a mobile app. It’s the right thing to focus on the customer experience. External Crowdsourcing: Using external sources are critical to successful innovation because sometimes the customer’s view of the experience is different from that the view of the company and its process. It’s important to remember, the most effective ideas come from outside of the scope of the existing program and process. Creative ideas come from anyone and anywhere. You may miss out on key ideas if you don’t ask, because people with those ideas may not volunteer them. Additionally, when you engage brilliant people, they think about a particular scenario where new and interesting ideas are generated which may not have previously been considered. Command and Control: Nothing will slow down the process of innovation more than incorporating a strict command and control process. Companies will not have to worry about going off topic or making a “wrong” decision if they properly carry out their innovation cycle by target based on their strategic goals. Not Taking Action on Winning Ideas: One way to understand if this is happening at your company is asking the question: Are we generating ideas, or have we established an innovation culture where winning ideas are taken through the innovation process and turned into actionable innovations that lead to successful business results? Planview Spigit is the largest enterprise-class provider of ideation management software which enables organizations to leverage the power of the crowd to create and manage the pipeline of ideas. Ideas can drive a variety of initiatives such as new business strategies, product development, operational effectiveness, and employee engagement. 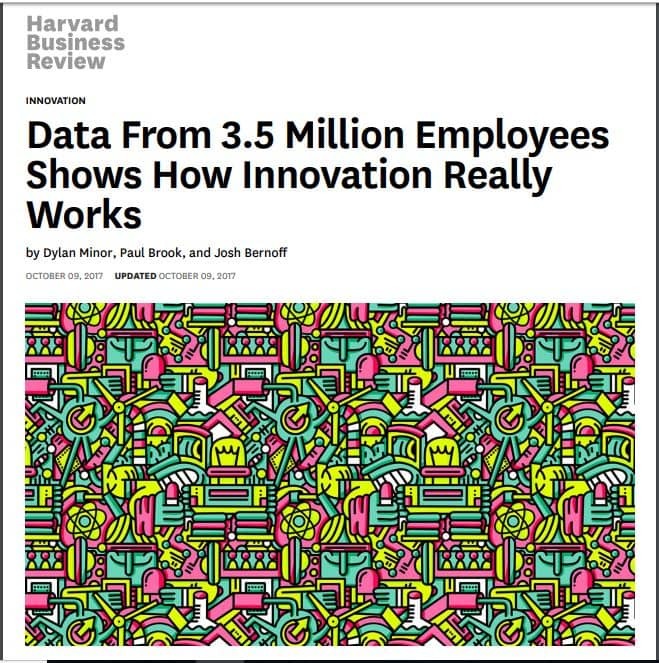 To learn more about the study read the Harvard Business Review article, “Data from 3.5 Million Employees Shows How Innovation Really Works,” or watch A New Science of Innovation webcast.